I am distinctly ambivalent about this book, but I will give it tentative positive review. After all, it is full of useful information. It is not just designed for people with disabilities, it is for ANYONE with issues in moving forward with for new employment. You don’t have to read this book “cover to cover.” It is designed for you to choose that areas that you need the most help in. 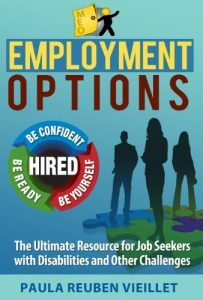 “Employment Options” is particularly good and detailed in the self-assessment areas. Another bonus is that this book is written by one of the experts who runs the website MY EMPLOYMENT OPTIONS, which is a national Social Security Administration (SSA) Employment Network in the Ticket To Work program. Not getting crossways with the federal government is important, these folks can help you avoid that cluster of issues. I have two problems with the book. 1. It doesn’t particularly help with avoiding problems with state and local intricacies. Attendant Care, and the payment thereof, is a state issue. Figuring a way to keep your PCAs paid for until you can afford to dump all state funding is a daunting task. Even if some states are better than Texas when it comes to this issue, EVERY state has problems. A number of people simply give up and decide to live in social media and watching TV. 2. I am already fairly confident in my job hunting skills. Yes, I will continue learning, but I don’t need someone holding my hand and pretending I need them to be my cheerleader. JUST GIVE ME THE FACTS AND THE STEPS and let me do what I need to do! When it comes to my first problem, I found NMD United to be a much better resource for me. It is for people with neuromuscular disorders, and covers circumstances like my own. So far, the people I met there are interesting, active, and proactive. If you are in Texas, there is also a Facebook group dedicated to our Texas members. If you want more information, contact me and I will tell you about them. When it comes to actual jobhunting skills, I think that an online course I’m taking is a MUCH better source of information. HOW TO FIND A WORK FROM HOME JOB OR SIDE GIG IN 30 DAYS OR LESS is interesting and fun. After a brief introduction and “setting the ground rules,” it BEGINS by talking about scams, and how to avoid them. I thought that the chapters on effective search strategies were particularly useful. I’m almost 1/2 of the way through. Next comes the resume and interview practice, then the cover letter. At the very end, there’s even a chapter about convincing the current boss to let you work from home. If you are interested in that class, here is the info. I found the video toward the top of the page to represent the style of the class very well.